Have you ever considered what a city needs to function in an orderly manner every day? Is it the way a city places certain time restrictions on street parking to account for rush hour traffic? Is it the way a city allows skyscrapers to develop in one part of the city and not in others? Is it the way recycling gets picked up on a set day, every other week? Cities develop plans that guide how to improve and sustain efficiency in the provision of city services and overall growth. The primary way cities accomplish this is through Urban Planning and the use of a Comprehensive Plan, also known as a Master Plan. 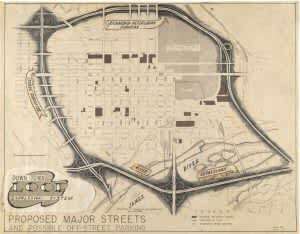 Urban Planning is a relatively new concept that started with the 1909 Plan of Chicago, considered by many as the first Comprehensive Plan. A Comprehensive Plan establishes visions and goals for various aspects of a city that may include the economic development, transportation, and housing needs of city residents. It can include creating niche spaces for small business start-ups or a large campus for a Fortune 500 company; enhancing new routes for bike lanes or fast ferries; or ensuring affordable housing and public education facilities remain accessible. 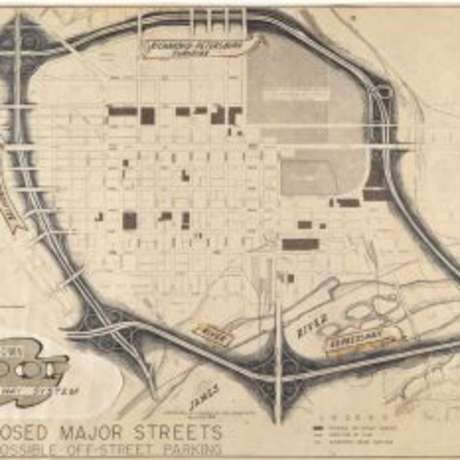 The maps on display in A City Personified are samples taken from documents produced for the purpose of planning for Richmond’s growth and evolution over the decades. This exhibit places the practice of comprehensive planning in a Richmond context and displays the ways in which the city anticipated how it might grow in the future. Did you know Richmond is currently in the midst a Comprehensive Plan update? We encourage everyone to get involved because as this exhibit illustrates, what we plan and implement now will be something upcoming generations will have to contend with in the future. This exhibit is possible thanks to the generosity of the City of Richmond Department of Planning and Review, and the Library of Virginia.